Little Miss Aurora was here last weekend. We spent much of our time in the sewing room making clothes for her American Girl Doll. During our conversations about school and what not, she told me how her grade two music teacher, loved Aurora's pencil case that had her name stitched on. So Aurora asked me if I would make two pencil cases this year...one for her regular teacher, Madam Annie and one for Madam Venessa. Aurora made me a note so I wouldn't forget. Good thing, because I almost forgot. 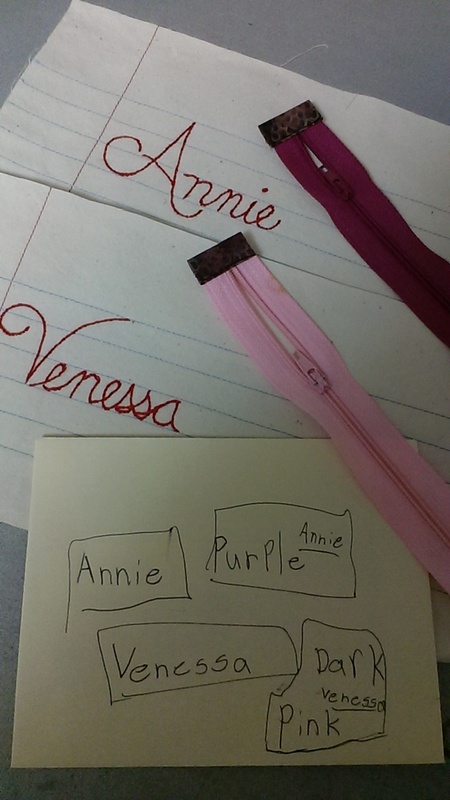 She even helped me by picking out the color of the zipper for each teacher. I stitched up some blue lines on fabric, added a red sideline to look like ruled paper. Then came the hand stitching of the cursive name in red floss. Now that the parts are finished, these two pencil cases will be a quick finish. Impressive Gail. Maybe you could bring the on Friday?